This restaurant in Kotturpuram takes you on a culinary journey through seven southern Indian regions, with its recipes well researched and collected from locals, grandmoms and chefs from the areas. Take one step inside Savya Rasa, Kotturpuram’s newest, hottest southern cuisine destination, and be prepared to be transported to another world altogether. With its simple yet sophisticated traditional décor elements (antique brass vessels and knick knacks, elegant wooden and cane furniture and ornate pillars) and its vibrant culinary presentation on the customary lush green leaf, Savya Rasa has a certain old-world charm that allows for a serene and beautiful meal experience. Find food that recreates authentic flavours with specific cultural identities and borne of specific culinary preparations unique to the areas. Savya Rasa offers Mysuru, Mangaluru, Malabar, Nellore, and Chettinad preparations among others. As you rest your feet on the smooth, cool Athangudi tiles, cool your insides with some Nannari Sherbet or a more adventurous Kokum Mojito, and snack on Kongunadu Vazhaipoo Vadais, Chettinad preparation Urulai Varuval or the ubiquitous fish finger in a Mangaluru style – Anjal Rava Fry. 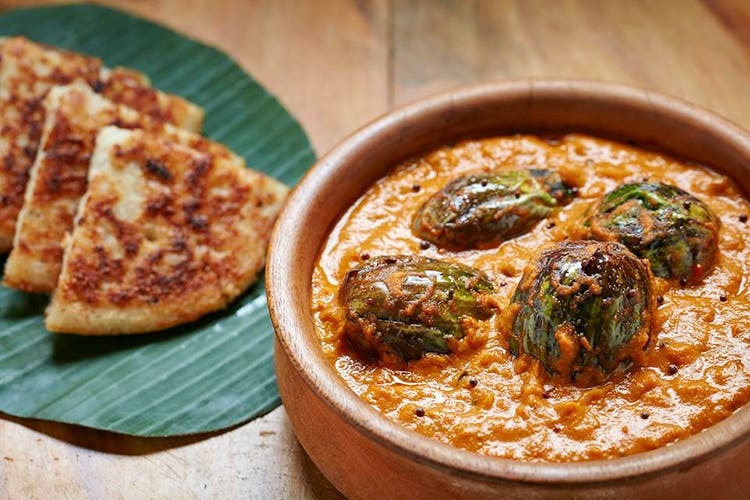 For the main course, feast on the Mysuru preparation of tender okra (Bendakkaigojju), the typical Nellore lip-smacking Gongura Pappu, or the famous Malabarian Kootu curry. Looking for comfort food? Try the samai thayir saadam or the deliciously fluffy Bun Parotta! There are a number of items on the menu, including pachadis, soups and other staples, so you’re likely to be spoiled for choice. And how could one possibly leave without dessert? The Elaneer pudding, a Kannur delicacy, is a must-have, as is the Ambalapuzha Paal Payasam. Or wash down your elaborate, flavourful meal with some steaming Sukku Kaapi (black with dry ginger) or some sweet Panakarkandu Milk, flavoured with the sugar of Tamil Nadu’s palms.